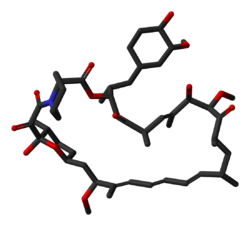 Sirolimus, also known as rapamycin, is a macrolide compound that is used to coat coronary stents, prevent organ transplant rejection and to treat a rare lung disease called lymphangioleiomyomatosis. It has immunosuppressant functions in humans and is especially useful in preventing the rejection of kidney transplants. It inhibits activation of T cells and B cells by reducing their sensitivity to interleukin-2 (IL-2) through mTOR inhibition. It is produced by the bacterium Streptomyces hygroscopicus and was isolated for the first time in 1972 by Surendra Nath Sehgal and colleagues from samples of Streptomyces hygroscopicus found on Easter Island. The compound was originally named rapamycin after the native name of the island, Rapa Nui. Sirolimus was initially developed as an antifungal agent. However, this use was abandoned when it was discovered to have potent immunosuppressive and antiproliferative properties due to its ability to inhibit mTOR. It was approved by the US Food and Drug Administration in September 1999 and is marketed under the trade name Rapamune by Pfizer (formerly by Wyeth). Sirolimus is indicated for the prevention of organ transplant rejection and for the treatment of lymphangioleiomyomatosis (LAM). The chief advantage sirolimus has over calcineurin inhibitors is its low toxicity toward kidneys. Transplant patients maintained on calcineurin inhibitors long-term tend to develop impaired kidney function or even chronic renal failure; this can be avoided by using sirolimus instead. It is particularly advantageous in patients with kidney transplants for hemolytic-uremic syndrome, as this disease is likely to recur in the transplanted kidney if a calcineurin-inhibitor is used. However, on 7 October 2008, the FDA approved safety labeling revisions for sirolimus to warn of the risk for decreased renal function associated with its use. In 2009, the FDA notified healthcare professionals that a clinical trial conducted by Wyeth showed an increased mortality in stable liver transplant patients after switching from a calcineurin inhibitor-based immunosuppressive regimen to sirolimus. Sirolimus can also be used alone, or in conjunction with a calcineurin inhibitor (such as tacrolimus), and/or mycophenolate mofetil, to provide steroid-free immunosuppression regimens. Impaired wound healing and thrombocytopenia are a possible side effects of sirolimus; therefore, some transplant centers prefer not to use it immediately after the transplant operation, but instead administer it only after a period of weeks or months. Its optimal role in immunosuppression has not yet been determined, and it remains the subject of a number of ongoing clinical trials. On May 28, 2015, the FDA approved sirolimus to treat lymphangioleiomyomatosis (LAM), a rare, progressive lung disease that primarily affects women of childbearing age. This made sirolimus the first drug approved to treat this disease. LAM involves lung tissue infiltration with smooth muscle-like cells with mutations of the tuberous sclerosis complex gene (TSC2). Loss of TSC2 gene function activates the mTOR signaling pathway, resulting in the release of lymphangiogenic growth factors. Sirolimus blocks this pathway. The safety and efficacy of sirolimus treatment of LAM were investigated in clinical trials that compared sirolimus treatment with a placebo group in 89 patients for 12 months. The patients were observed for 12 months after the treatment had ended. The most commonly reported side effect of sirolimus treatment of LAM were mouth and lip ulcers, diarrhea, abdominal pain, nausea, sore throat, acne, chest pain, leg swelling, upper respiratory tract infection, headache, dizziness, muscle pain and elevated cholesterol. Serious side effects including hypersensitivity and swelling (edema) have been observed in renal transplant patients. While sirolimus was considered for treatment of LAM, it received orphan product designation status because LAM is a rare condition. Development for the product was partially supported by the FDA Orphan Products Grants Program, which provides grants for clinical studies on safety and/or effectiveness of products for use in rare diseases or conditions. The safety of LAM treatment by sirolimus in patients younger than 18 years old has not been tested. The antiproliferative effect of sirolimus has also been used in conjunction with coronary stents to prevent restenosis in coronary arteries following balloon angioplasty. The sirolimus is formulated in a polymer coating that affords controlled release through the healing period following coronary intervention. Several large clinical studies have demonstrated lower restenosis rates in patients treated with sirolimus-eluting stents when compared to bare-metal stents, resulting in fewer repeat procedures. A sirolimus-eluting coronary stent was marketed by Cordis, a division of Johnson & Johnson, under the tradename Cypher. However, this kind of stent may also increase the risk of vascular thrombosis. Sirolimus is contraindicated in individuals with a known hypersensitivity to the drug. The most common adverse reactions (≥30% occurrence, leading to a 5% treatment discontinuation rate) observed with sirolimus in clinical studies of organ rejection prophylaxis in individuals with kidney transplants include: peripheral edema, hypercholesterolemia, abdominal pain, headache, nausea, diarrhea, pain, constipation, hypertriglyceridemia, hypertension, increased creatinine, fever, urinary tract infection, anemia, arthralgia, and thrombocytopenia. The most common adverse reactions (≥20% occurrence, leading to an 11% treatment discontinuation rate) observed with sirolimus in clinical studies for the treatment of lymphangioleiomyomatosis are: peripheral edema, hypercholesterolemia, abdominal pain, headache, nausea, diarrhea, chest pain, stomatitis, nasopharyngitis, acne, upper respiratory tract infection, dizziness, and myalgia. While sirolimus inhibition of mTORC1 appears to mediate the drug's benefits, it also inhibits mTORC2, which results in diabetes-like symptoms. This includes decreased glucose tolerance and insensitivity to insulin. Sirolimus treatment may additionally increase the risk of type 2 diabetes. In mouse studies, these symptoms can be avoided through the use of alternate dosing regimens or analogs such as everolimus or temsirolimus. Lung toxicity is a serious complication associated with sirolimus therapy, especially in the case of lung transplants. The mechanism of the interstitial pneumonitis caused by sirolimus and other macrolide MTOR inhibitors is unclear, and may have nothing to do with the mTOR pathway. The interstitial pneumonitis is not dose-dependent, but is more common in patients with underlying lung disease. There have been warnings about the use of sirolimus in transplants, where it may increase mortality due to an increased risk of infections. According to the FDA prescribing information, sirolimus may increase an individual's risk for contracting skin cancers from exposure to sunlight or UV radiation, and risk of developing lymphoma. In studies, the skin cancer risk under sirolimus was lower than under other immunosuppressants such as azathioprine and calcineurin inhibitors, and lower than under placebo. Individuals taking sirolimus are at increased risk of experiencing impaired or delayed wound healing, particularly if they have a high body mass index (i.e., a BMI of ≥30 kg/m2). Sirolimus is metabolized by the CYP3A4 enzyme and is a substrate of the P-glycoprotein (P-gp) efflux pump; hence, inhibitors of either protein may increase sirolimus concentrations in blood plasma, whereas inducers of CYP3A4 and P-gp may decrease sirolimus concentrations in blood plasma. Unlike the similarly named tacrolimus, sirolimus is not a calcineurin inhibitor, but it has a similar suppressive effect on the immune system. Sirolimus inhibits IL-2 and other cytokine receptor-dependent signal transduction mechanisms, via action on mTOR, and thereby blocks activation of T and B cells. Ciclosporin and tacrolimus inhibit the secretion of IL-2, by inhibiting calcineurin. The mode of action of sirolimus is to bind the cytosolic protein FK-binding protein 12 (FKBP12) in a manner similar to tacrolimus. Unlike the tacrolimus-FKBP12 complex, which inhibits calcineurin (PP2B), the sirolimus-FKBP12 complex inhibits the mTOR (mammalian Target Of Rapamycin, rapamycin being another name for sirolimus) pathway by directly binding to mTOR Complex 1 (mTORC1). mTOR has also been called FRAP (FKBP-rapamycin-associated protein), RAFT (rapamycin and FKBP target), RAPT1, or SEP. The earlier names FRAP and RAFT were coined to reflect the fact that sirolimus must bind FKBP12 first, and only the FKBP12-sirolimus complex can bind mTOR. However, mTOR is now the widely accepted name, since Tor was first discovered via genetic and molecular studies of sirolimus-resistant mutants of Saccharomyces cerevisiae that identified FKBP12, Tor1, and Tor2 as the targets of sirolimus and provided robust support that the FKBP12-sirolimus complex binds to and inhibits Tor1 and Tor2. Sirolimus is metabolized by the CYP3A4 enzyme and is a substrate of the P-glycoprotein (P-gp) efflux pump. It has an elimination half-life of 57–63 hours. Sirolimus is a natural product and macrocyclic lactone. The biosynthesis of the rapamycin core is accomplished by a type I polyketide synthase (PKS) in conjunction with a nonribosomal peptide synthetase (NRPS). The domains responsible for the biosynthesis of the linear polyketide of rapamycin are organized into three multienzymes, RapA, RapB, and RapC, which contain a total of 14 modules (figure 1). 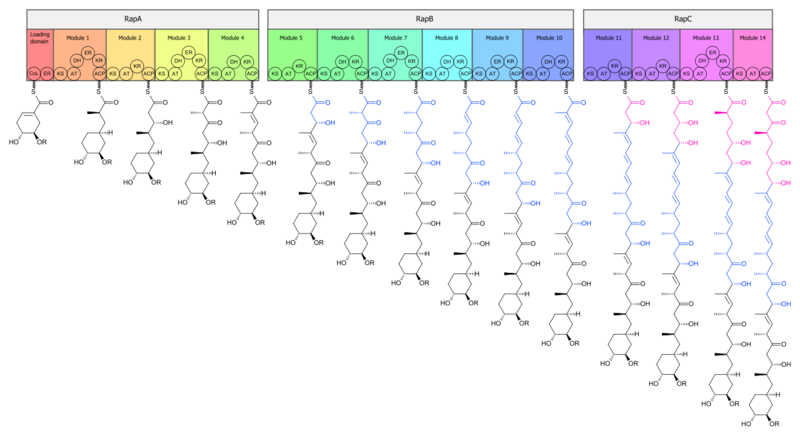 The three multienzymes are organized such that the first four modules of polyketide chain elongation are in RapA, the following six modules for continued elongation are in RapB, and the final four modules to complete the biosynthesis of the linear polyketide are in RapC. Then, the linear polyketide is modified by the NRPS, RapP, which attaches L-pipecolate to the terminal end of the polyketide, and then cyclizes the molecule, yielding the unbound product, prerapamycin. The core macrocycle, prerapamycin (figure 2), is then modified (figure 3) by an additional five enzymes, which lead to the final product, rapamycin. First, the core macrocycle is modified by RapI, SAM-dependent O-methyltransferase (MTase), which O-methylates at C39. Next, a carbonyl is installed at C9 by RapJ, a cytochrome P-450 monooxygenases (P-450). Then, RapM, another MTase, O-methylates at C16. Finally, RapN, another P-450, installs a hydroxyl at C27 immediately followed by O-methylation by Rap Q, a distinct MTase, at C27 to yield rapamycin. The biosynthetic genes responsible for rapamycin synthesis have been identified. As expected, three extremely large open reading frames (ORF's) designated as rapA, rapB, and rapC encode for three extremely large and complex multienzymes, RapA, RapB, and RapC, respectively. The gene rapL has been established to code for a NAD+-dependent lysine cycloamidase, which converts L-lysine to L-pipecolic acid (figure 4) for incorporation at the end of the polyketide. 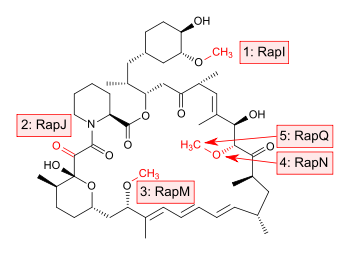 The gene rapP, which is embedded between the PKS genes and translationally coupled to rapC, encodes for an additional enzyme, an NPRS responsible for incorporating L-pipecolic acid, chain termination and cyclization of prerapamycin. In addition, genes rapI, rapJ, rapM, rapN, rapO, and rapQ have been identified as coding for tailoring enzymes that modify the macrocyclic core to give rapamycin (figure 3). Finally, rapG and rapH have been identified to code for enzymes that have a positive regulatory role in the preparation of rapamycin through the control of rapamycin PKS gene expression. Biosynthesis of this 31-membered macrocycle begins as the loading domain is primed with the starter unit, 4,5-dihydroxocyclohex-1-ene-carboxylic acid, which is derived from the shikimate pathway. Note that the cyclohexane ring of the starting unit is reduced during the transfer to module 1. The starting unit is then modified by a series of Claisen condensations with malonyl or methylmalonyl substrates, which are attached to an acyl carrier protein (ACP) and extend the polyketide by two carbons each. After each successive condensation, the growing polyketide is further modified according to enzymatic domains that are present to reduce and dehydrate it, thereby introducing the diversity of functionalities observed in rapamycin (figure 1). Once the linear polyketide is complete, L-pipecolic acid, which is synthesized by a lysine cycloamidase from an L-lysine, is added to the terminal end of the polyketide by an NRPS. Then, the NSPS cyclizes the polyketide, giving prerapamycin, the first enzyme-free product. The macrocyclic core is then customized by a series of post-PKS enzymes through methylations by MTases and oxidations by P-450s to yield rapamycin. The antiproliferative effects of sirolimus may have a role in treating cancer. When dosed appropriately, sirolimus can enhance the immune response to tumor targeting or otherwise promote tumor regression in clinical trials. Sirolimus seems to lower the cancer risk in some transplant patients. Sirolimus was shown to inhibit the progression of dermal Kaposi's sarcoma in patients with renal transplants. Other mTOR inhibitors, such as temsirolimus (CCI-779) or everolimus (RAD001), are being tested for use in cancers such as glioblastoma multiforme and mantle cell lymphoma. However, these drugs have a higher rate of fatal adverse events in cancer patients than control drugs. A combination therapy of doxorubicin and sirolimus has been shown to drive AKT-positive lymphomas into remission in mice. Akt signalling promotes cell survival in Akt-positive lymphomas and acts to prevent the cytotoxic effects of chemotherapy drugs, such as doxorubicin or cyclophosphamide. Sirolimus blocks Akt signalling and the cells lose their resistance to the chemotherapy. Bcl-2-positive lymphomas were completely resistant to the therapy; eIF4E-expressing lymphomas are not sensitive to sirolimus. Sirolimus also shows promise in treating tuberous sclerosis complex (TSC), a congenital disorder that leaves sufferers prone to benign tumor growth in the brain, heart, kidneys, skin, and other organs. After several studies conclusively linked mTOR inhibitors to remission in TSC tumors, specifically subependymal giant-cell astrocytomas in children and angiomyolipomas in adults, many US doctors began prescribing sirolimus (Wyeth's Rapamune) and everolimus (Novartis's RAD001) to TSC patients off-label. Numerous clinical trials using both rapamycin analogs, involving both children and adults with TSC, are underway in the United States. Facial angiofibromas occur in 80% of patients with TSC, and the condition is very disfiguring. A retrospective review of English-language medical publications reporting on topical sirolimus treatment of facial angiofibromas found sixteen separate studies with positive patient outcomes after using the drug. The reports involved a total of 84 patients, and improvement was observed in 94% of subjects, especially if treatment began during the early stages of the disease. Sirolimus treatment was applied in several different formulations (ointment, gel, solution, and cream), ranging from 0.003 to 1% concentrations. Reported adverse effects included one case of perioral dermatitis, one case of cephalea, and four cases of irritation. mTOR, specifically mTOR1, was first shown to be important in aging in 2003, in a study on worms; sirolimus was shown to inhibit and slow aging in worms, yeast, and flies, and then to improve the condition of mouse models of various diseases of aging. Sirolimus was first shown to extend lifespan in wild-type mice in a study published by NIH investigators in 2009; the studies have been replicated in mice of many different genetic backgrounds. The results are further supported by the finding that genetically modified mice with impaired mTOR1 signalling live longer. The known adverse effects caused by sirolimus and marketed analogs at the doses used in transplant regimens, especially the increased risk of infection due to immunosuppression, as well as dose-dependent metabolic impairment, make it unlikely that this could become a widely used anti-aging agent. Among the strategies that have been explored to minimize such side effects are intermittent treatment regimens and combinations with insulin sentitizers (rosiglitazone) or antidiabetics (metformin) to prevent metabolic dysfunction. In contrast to the immunosuppressive effects found in long-term high dosing, a study combining low-dose Everolimus (a rapamycin analog) and Dactolisib for a single 6 week course followed by influenza vaccination in healthy elderly patients (>65 years of age) found that this combination significantly reduced the number of infections reported by participants relative to placebo (from 2.41 to 1.49 infections per person per year), increased the serological response by more than 20%, did not produce any excess events of hyperglycemia or hypercholesteremia (associated with mTORC2 inhibition) and was generally well tolerated. Rapamycin has complex effects on the immune system—while IL-12 goes up and IL-10 decreases, which suggests an immunostimulatory response, TNF and IL-6 are decreased, which suggests an immunosuppressive response. The duration of the inhibition and the exact extent to which mTORC1 and mTORC2 are inhibited play a role, but are not yet well understood. As of 2016 studies in cells, animals, and humans have suggested that mTOR activation as process underlying systemic lupus erythematosus and that inhibiting mTOR with rapamycin may be a disease-modifying treatment. As of 2016 rapamycin had been tested in small clinical trials in people with lupus. Lymphatic malformation is either a superficial, deep or mixed growth of lymphatic vessels. Treatment is limited to removal or destruction, however, the rate of recurrence is high. García M et al made a topical formulation of rapamycin, and conducted a small case series, involving 11 patients with superficial lymphatic malformations. The clinical appearance improved in all 11, and symptoms improved in 9 of the 11. The average follow-up time was 16.1 months, indicating that topical rapamycin, ranging from .4-1.0% is promising for management of superficial lymphatic malformations. Rapamycin is used in biology research as an agent for chemically induced dimerization. In this application, rapamycin is added to cells expressing two fusion constructs, one of which contains the rapamycin-binding FRB domain from mTOR and the other of which contains an FKBP domain. Each fusion protein also contains additional domains that are brought into proximity when rapamycin induces binding of FRB and FKBP. In this way, rapamycin can be used to control and study protein localization and interactions. ^ Buck ML (2006). "Immunosuppression With Sirolimus After Solid Organ Transplantation in Children". Pediatric Pharmacotherapy. 12 (2). ^ a b c d "Rapamycin". PubChem Compound. National Center for Biotechnology Information. Retrieved 1 August 2016. ^ Simamora P, Alvarez JM, Yalkowsky SH (February 2001). "Solubilization of rapamycin". International Journal of Pharmaceutics. 213 (1–2): 25–9. doi:10.1016/s0378-5173(00)00617-7. PMID 11165091. ^ a b c d e f g h i j k l m "Rapamune Prescribing Information" (PDF). United States Food and Drug Administration. Wyeth Pharmaceuticals, Inc. May 2015. Retrieved 28 May 2016. ^ a b Vézina C, Kudelski A, Sehgal SN (October 1975). "Rapamycin (AY-22,989), a new antifungal antibiotic. I. Taxonomy of the producing streptomycete and isolation of the active principle". The Journal of Antibiotics. 28 (10): 721–6. doi:10.7164/antibiotics.28.721. PMID 1102508. ^ a b "Cypher Sirolimus-eluting Coronary Stent". Cypher Stent. Archived from the original on 27 April 2003. Retrieved 1 April 2008. ^ a b c d e f Mukherjee S, Mukherjee U (2009-01-01). "A comprehensive review of immunosuppression used for liver transplantation". Journal of Transplantation. 2009: 1–20. doi:10.1155/2009/701464. PMC 2809333. PMID 20130772. ^ Seto B (November 2012). "Rapamycin and mTOR: a serendipitous discovery and implications for breast cancer". Clinical and Translational Medicine. 1 (1): 29. doi:10.1186/2001-1326-1-29. PMC 3561035. PMID 23369283. ^ Pritchard DI (May 2005). "Sourcing a chemical succession for cyclosporin from parasites and human pathogens". Drug Discovery Today. 10 (10): 688–91. doi:10.1016/S1359-6446(05)03395-7. PMID 15896681. ^ Li JJ, Corey EJ (2013-04-03). Drug Discovery: Practices, Processes, and Perspectives. John Wiley & Sons. ISBN 978-1-118-35446-9. ^ Koprowski G (2012-02-07). Nanotechnology in Medicine: Emerging Applications. Momentum Press. ISBN 978-1-60650-250-1. ^ "Sirolimus (marketed as Rapamune) Safety". FDA.gov. U.S. Food and Drug Administration. 11 June 2009. Retrieved 1 Aug 2016. ^ a b c Pahon E (May 28, 2015). "FDA approves Rapamune to treat LAM, a very rare lung disease". FDA.gov. U.S. Food and Drug Administration. Retrieved 1 Aug 2016. ^ Shuchman M (November 2006). "Trading restenosis for thrombosis? New questions about drug-eluting stents". The New England Journal of Medicine. 355 (19): 1949–52. doi:10.1056/NEJMp068234. PMID 17093244. ^ Lamming DW, Ye L, Katajisto P, Goncalves MD, Saitoh M, Stevens DM, Davis JG, Salmon AB, Richardson A, Ahima RS, Guertin DA, Sabatini DM, Baur JA (March 2012). "Rapamycin-induced insulin resistance is mediated by mTORC2 loss and uncoupled from longevity". Science. 335 (6076): 1638–43. Bibcode:2012Sci...335.1638L. doi:10.1126/science.1215135. PMC 3324089. PMID 22461615. ^ Johnston O, Rose CL, Webster AC, Gill JS (July 2008). "Sirolimus is associated with new-onset diabetes in kidney transplant recipients". Journal of the American Society of Nephrology. 19 (7): 1411–8. doi:10.1681/ASN.2007111202. PMC 2440303. PMID 18385422. ^ Arriola Apelo SI, Neuman JC, Baar EL, Syed FA, Cummings NE, Brar HK, Pumper CP, Kimple ME, Lamming DW (February 2016). "Alternative rapamycin treatment regimens mitigate the impact of rapamycin on glucose homeostasis and the immune system". Aging Cell. 15 (1): 28–38. doi:10.1111/acel.12405. PMC 4717280. PMID 26463117. ^ a b Chhajed PN, Dickenmann M, Bubendorf L, Mayr M, Steiger J, Tamm M (2006). "Patterns of pulmonary complications associated with sirolimus". Respiration. 73 (3): 367–74. doi:10.1159/000087945. PMID 16127266. ^ Morelon E, Stern M, Israël-Biet D, Correas JM, Danel C, Mamzer-Bruneel MF, Peraldi MN, Kreis H (September 2001). "Characteristics of sirolimus-associated interstitial pneumonitis in renal transplant patients". Transplantation. 72 (5): 787–90. doi:10.1097/00007890-200109150-00008. PMID 11571438. ^ Filippone EJ, Carson JM, Beckford RA, Jaffe BC, Newman E, Awsare BK, Doria C, Farber JL (September 2011). "Sirolimus-induced pneumonitis complicated by pentamidine-induced phospholipidosis in a renal transplant recipient: a case report". Transplantation Proceedings. 43 (7): 2792–7. doi:10.1016/j.transproceed.2011.06.060. PMID 21911165. ^ Pham PT, Pham PC, Danovitch GM, Ross DJ, Gritsch HA, Kendrick EA, Singer J, Shah T, Wilkinson AH (April 2004). "Sirolimus-associated pulmonary toxicity". Transplantation. 77 (8): 1215–20. doi:10.1097/01.TP.0000118413.92211.B6. PMID 15114088. ^ Mingos MA, Kane GC (December 2005). "Sirolimus-induced interstitial pneumonitis in a renal transplant patient" (PDF). Respiratory Care. 50 (12): 1659–61. PMID 16318648. ^ Das BB, Shoemaker L, Subramanian S, Johnsrude C, Recto M, Austin EH (March 2007). "Acute sirolimus pulmonary toxicity in an infant heart transplant recipient: case report and literature review". The Journal of Heart and Lung Transplantation. 26 (3): 296–8. doi:10.1016/j.healun.2006.12.004. PMID 17346635. ^ Delgado JF, Torres J, José Ruiz-Cano M, Sánchez V, Escribano P, Borruel S, María Cortina J, de la Calzada CS (September 2006). "Sirolimus-associated interstitial pneumonitis in 3 heart transplant recipients". The Journal of Heart and Lung Transplantation. 25 (9): 1171–4. doi:10.1016/j.healun.2006.05.013. PMID 16962483. ^ McWilliams TJ, Levvey BJ, Russell PA, Milne DG, Snell GI (February 2003). "Interstitial pneumonitis associated with sirolimus: a dilemma for lung transplantation". The Journal of Heart and Lung Transplantation. 22 (2): 210–3. doi:10.1016/S1053-2498(02)00564-8. PMID 12581772. ^ Aparicio G, Calvo MB, Medina V, Fernández O, Jiménez P, Lema M, Figueroa A, Antón Aparicio LM (August 2009). "Comprehensive lung injury pathology induced by mTOR inhibitors". Clinical & Translational Oncology. 11 (8): 499–510. doi:10.1007/s12094-009-0394-y. PMID 19661024. ^ Paris A, Goupil F, Kernaonet E, Foulet-Rogé A, Molinier O, Gagnadoux F, Lebas FX (January 2012). "[Drug-induced pneumonitis due to sirolimus: an interaction with atorvastatin?]". Revue des Maladies Respiratoires (in French). 29 (1): 64–9. doi:10.1016/j.rmr.2010.03.026. PMID 22240222. ^ Maroto JP, Hudes G, Dutcher JP, Logan TF, White CS, Krygowski M, Cincotta M, Shapiro M, Duran I, Berkenblit A (May 2011). "Drug-related pneumonitis in patients with advanced renal cell carcinoma treated with temsirolimus". Journal of Clinical Oncology. 29 (13): 1750–6. doi:10.1200/JCO.2010.29.2235. PMID 21444868. Archived from the original on 2013-04-15. ^ Errasti P, Izquierdo D, Martín P, Errasti M, Slon F, Romero A, Lavilla FJ (October 2010). "Pneumonitis associated with mammalian target of rapamycin inhibitors in renal transplant recipients: a single-center experience". Transplantation Proceedings. 42 (8): 3053–4. doi:10.1016/j.transproceed.2010.07.066. PMID 20970608. ^ "RAPAMUNE- sirolimus solution RAPAMUNE- sirolimus tablet, sugar coated". dailymed.nlm.nih.gov. DailyMed. ^ FDA Professional Drug Information on Rapamune. Accessed 29-09-2017. ^ Euvrard S, Morelon E, Rostaing L, Goffin E, Brocard A, Tromme I, Broeders N, del Marmol V, Chatelet V, Dompmartin A, Kessler M, Serra AL, Hofbauer GF, Pouteil-Noble C, Campistol JM, Kanitakis J, Roux AS, Decullier E, Dantal J (July 2012). "Sirolimus and secondary skin-cancer prevention in kidney transplantation". The New England Journal of Medicine. 367 (4): 329–39. doi:10.1056/NEJMoa1204166. PMID 22830463. ^ Heitman J, Movva NR, Hall MN (1991). "Targets for cell cycle arrest by the immunosuppressant rapamycin in yeast". Science. 253 (5022): 905–9. Bibcode:1991Sci...253..905H. doi:10.1126/science.1715094. PMID 1715094. ^ McAlister VC, Mahalati K, Peltekian KM, Fraser A, MacDonald AS (June 2002). "A clinical pharmacokinetic study of tacrolimus and sirolimus combination immunosuppression comparing simultaneous to separated administration". Therapeutic Drug Monitoring. 24 (3): 346–50. doi:10.1097/00007691-200206000-00004. PMID 12021624. ^ a b c Schwecke T, Aparicio JF, Molnár I, König A, Khaw LE, Haydock SF, Oliynyk M, Caffrey P, Cortés J, Lester JB (August 1995). "The biosynthetic gene cluster for the polyketide immunosuppressant rapamycin". Proceedings of the National Academy of Sciences of the United States of America. 92 (17): 7839–43. Bibcode:1995PNAS...92.7839S. doi:10.1073/pnas.92.17.7839. PMC 41241. PMID 7644502. ^ Gregory MA, Gaisser S, Lill RE, Hong H, Sheridan RM, Wilkinson B, Petkovic H, Weston AJ, Carletti I, Lee HL, Staunton J, Leadlay PF (May 2004). "Isolation and characterization of pre-rapamycin, the first macrocyclic intermediate in the biosynthesis of the immunosuppressant rapamycin by S. hygroscopicus". Angewandte Chemie. 43 (19): 2551–3. doi:10.1002/anie.200453764. PMID 15127450. ^ Gregory MA, Hong H, Lill RE, Gaisser S, Petkovic H, Low L, Sheehan LS, Carletti I, Ready SJ, Ward MJ, Kaja AL, Weston AJ, Challis IR, Leadlay PF, Martin CJ, Wilkinson B, Sheridan RM (October 2006). "Rapamycin biosynthesis: Elucidation of gene product function". Organic & Biomolecular Chemistry. 4 (19): 3565–8. doi:10.1039/b608813a. PMID 16990929. ^ Graziani EI (May 2009). "Recent advances in the chemistry, biosynthesis and pharmacology of rapamycin analogs". Natural Product Reports. 26 (5): 602–9. doi:10.1039/b804602f. PMID 19387497. ^ Gatto GJ, Boyne MT, Kelleher NL, Walsh CT (March 2006). "Biosynthesis of pipecolic acid by RapL, a lysine cyclodeaminase encoded in the rapamycin gene cluster". Journal of the American Chemical Society. 128 (11): 3838–47. doi:10.1021/ja0587603. PMID 16536560. ^ Aparicio JF, Molnár I, Schwecke T, König A, Haydock SF, Khaw LE, Staunton J, Leadlay PF (February 1996). "Organization of the biosynthetic gene cluster for rapamycin in Streptomyces hygroscopicus: analysis of the enzymatic domains in the modular polyketide synthase". Gene. 169 (1): 9–16. doi:10.1016/0378-1119(95)00800-4. PMID 8635756. ^ Li Q, Rao R, Vazzana J, Goedegebuure P, Odunsi K, Gillanders W, Shrikant PA (April 2012). "Regulating mammalian target of rapamycin to tune vaccination-induced CD8(+) T cell responses for tumor immunity". Journal of Immunology. 188 (7): 3080–7. doi:10.4049/jimmunol.1103365. PMC 3311730. PMID 22379028. ^ Law BK (October 2005). "Rapamycin: an anti-cancer immunosuppressant?". Critical Reviews in Oncology/Hematology. 56 (1): 47–60. doi:10.1016/j.critrevonc.2004.09.009. PMID 16039868. ^ "Fatal AEs Higher with mTOR Drugs in Cancer". Med Page Today. 17 February 2013. ^ Sun SY, Rosenberg LM, Wang X, Zhou Z, Yue P, Fu H, Khuri FR (August 2005). "Activation of Akt and eIF4E survival pathways by rapamycin-mediated mammalian target of rapamycin inhibition". Cancer Research. 65 (16): 7052–8. doi:10.1158/0008-5472.CAN-05-0917. PMID 16103051. ^ Chan S (October 2004). "Targeting the mammalian target of rapamycin (mTOR): a new approach to treating cancer". British Journal of Cancer. 91 (8): 1420–4. doi:10.1038/sj.bjc.6602162. PMC 2409926. PMID 15365568. ^ Wendel HG, De Stanchina E, Fridman JS, Malina A, Ray S, Kogan S, Cordon-Cardo C, Pelletier J, Lowe SW (March 2004). "Survival signalling by Akt and eIF4E in oncogenesis and cancer therapy". Nature. 428 (6980): 332–7. Bibcode:2004Natur.428..332W. doi:10.1038/nature02369. PMID 15029198. Lay summary – ScienceDaily (18 March 2004). ^ Novak, Kristine (May 2004). "Therapeutics: Means to an end". Nature Reviews Cancer. 4 (5): 332. doi:10.1038/nrc1349. ^ Tuberous Sclerosis Alliance (October 2009). "Current Clinical Trials". Archived from the original on 22 January 2009. Retrieved 14 October 2009. ^ Balestri R, Neri I, Patrizi A, Angileri L, Ricci L, Magnano M (January 2015). "Analysis of current data on the use of topical rapamycin in the treatment of facial angiofibromas in tuberous sclerosis complex". Journal of the European Academy of Dermatology and Venereology. 29 (1): 14–20. doi:10.1111/jdv.12665. PMID 25174683. ^ a b c d Arriola Apelo SI, Lamming DW (July 2016). "Rapamycin: An InhibiTOR of Aging Emerges From the Soil of Easter Island". The Journals of Gerontology. Series A, Biological Sciences and Medical Sciences. 71 (7): 841–9. doi:10.1093/gerona/glw090. PMC 4906330. PMID 27208895. A diverse and severe set of negative side effects likely preclude the wide-scale use of rapamycin and its analogs as a prolongevity agent. ^ Harrison DE, Strong R, Sharp ZD, Nelson JF, Astle CM, Flurkey K, Nadon NL, Wilkinson JE, Frenkel K, Carter CS, Pahor M, Javors MA, Fernandez E, Miller RA (July 2009). "Rapamycin fed late in life extends lifespan in genetically heterogeneous mice". Nature. 460 (7253): 392–5. Bibcode:2009Natur.460..392H. doi:10.1038/nature08221. PMC 2786175. PMID 19587680. ^ Salmon AB (February 2015). "About-face on the metabolic side effects of rapamycin". Oncotarget. 6 (5): 2585–6. doi:10.18632/oncotarget.3354. PMC 4413601. PMID 25691064. ^ Weichhart T, Hengstschläger M, Linke M (October 2015). "Regulation of innate immune cell function by mTOR". Nature Reviews. Immunology. 15 (10): 599–614. doi:10.1038/nri3901. PMC 6095456. PMID 26403194. ^ a b Oaks Z, Winans T, Huang N, Banki K, Perl A (December 2016). "Activation of the Mechanistic Target of Rapamycin in SLE: Explosion of Evidence in the Last Five Years". Current Rheumatology Reports. 18 (12): 73. doi:10.1007/s11926-016-0622-8. PMC 5314949. PMID 27812954. ^ García, M (December 2018). "The Use of Topical Rapamycin in the Treatment of Superficial Lymphatic Malformations". JAAD. 80: 508–15. ^ Rivera VM, Clackson T, Natesan S, Pollock R, Amara JF, Keenan T, Magari SR, Phillips T, Courage NL, Cerasoli F, Holt DA, Gilman M (September 1996). "A humanized system for pharmacologic control of gene expression". Nature Medicine. 2 (9): 1028–32. doi:10.1038/nm0996-1028. PMID 8782462. Wikimedia Commons has media related to Sirolimus. Benjamin D, Colombi M, Moroni C, Hall MN (October 2011). "Rapamycin passes the torch: a new generation of mTOR inhibitors". Nature Reviews. Drug Discovery. 10 (11): 868–80. doi:10.1038/nrd3531. PMID 22037041.